Bibron's Geckos are fairly common as pets, although their sensitive skin makes them better suited for observation than for handling. An arboreal species, the Bibron's Gecko spends most of its time in trees in the wild. This species is known as a "colonial species" because they are often found in groups as large as 20. In captivity, however, it may not be a good idea to house multiple Bibron's Geckos together because males tend to be aggressive and they have been known to eat each other. If they must be kept in groups they should not be housed in anything larger than one male-female pair. Some Bibron's Geckos may bite their handlers. They are diurnal, meaning they are most active during the day. They are native to semitropical regions of Africa and enjoy basking in temperatures as high as 110 degrees Fahrenheit. Bibron's Geckos are insectivores in the wild, and do well on a diet of insects in captivity as well. In captivity they usually eat well and are a long-lived species. The Bibron's Gecko is relatively easy to find in the pet-trade and usually makes a good pet. Because their skin is sensitive and easily damaged they may not be suitable for children. For this reason children should not handle them without supervision. The Bibron's Gecko is a relatively large gecko and is recognized by its beaded appearance. Their main color is brown, though shades tend to vary throughout and also vary between individuals. This species is easily recognized by the presence of five dark brown stripes that run along their backs. Each stripe is outlined with white spots. The average Bibron's Gecko can reach up to seven inches in length, though some larger individuals have been reported. Bibron's Geckos are native to Southern Africa and are quite common throughout their range. Bibron's Geckos should be kept in an environment with an average daytime temperature between 75 and 85 degrees Fahrenheit. They should be provided with a basking lamp with temperatures between 95 and 110 degrees Fahrenheit. Nighttime temperatures average between 65 and 75 degrees Fahrenheit. Bibron's Geckos should be given light from an ultraviolet lamp, between twelve and fourteen hours a day. The ideal humidity of 65 degrees can be achieved by daily misting. The Bibron's Gecko should be fed insects that have been dusted with a calcium supplement three or four times a week. A multivitamin is recommended about once or twice a week. While growing, juveniles can be fed twice a day. A shallow water bowl should be provided. A single Bibron's Gecko can be housed comfortably in a twenty-gallon terrarium with a screened lid for ventilation. The enclosure should have hiding areas, a shaded area to cool off, climbing branches and a basking area. Plants, either natural or artificial, are also recommended. Bibron's Geckos are best kept separately unless breeding. 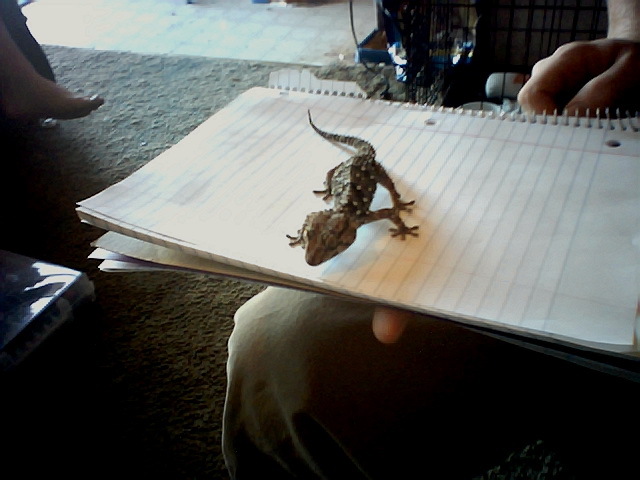 Bibron's Geckos should not be handled excessively. They are very fast moving and have sensitive skin, which can be damaged very easily. They are not good pets for children and should only be handled by children in the presence of an adult. Bibron's Geckos breed fairly easily and are bred regularly in captivity. Babies are approximately two inches in length, including the tail. Babies should be removed from the parent's tank. They should be fed daily with small crickets between 1/8 and 1/4 of an inch long.